It doesn't get better than this: Avocado Bacon Egg Rolls! They are a delicious party food made with only a few ingredients and a few steps. Prepare for your newest addiction! The ingredients are very simple: perfectly ripe avocado slices are drizzled with lime and then sprinkle with salt. 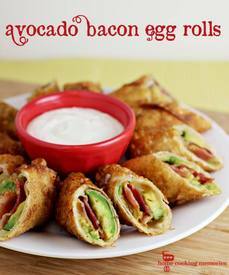 For each egg roll, you create a stack of avocado slices, crispy bacon, and pepper jack cheese on an egg roll wrapper. So simple, yet so delicious!! Having a dip with your Bacon Avocado Egg Rolls is good and I think it makes a more impressive presentation. I actually think they are perfect without a dip, but I always serve them with something as I have certain family members who believe it’s a crime to enjoy things like this without a dip. Some dip ideas are: salsa, ranch dressing, chipotle ranch dip, sweet Thai chili sauce…but I’d love to hear your ideas. How would you dip these?